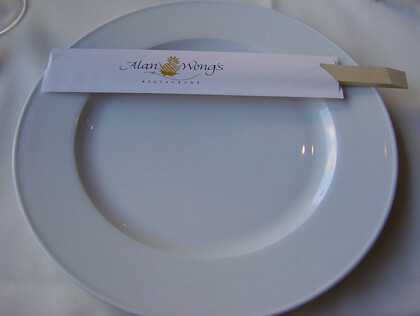 The night before we left, we went to Alan Wong’s for dinner. This was actually the only planning we did before hand — I made reservations a month or so in advance:) All our other activities we planned after we arrived. Al blogged about this, too. Drinks first thing! 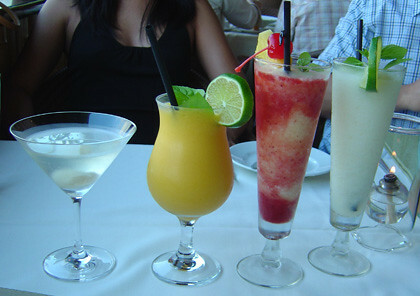 :) The drinks are Julie’s Lychee Tini (Iichiko Shochu with Lychee Juice), then my Mango Melange A Trois (Mango blended with Coconut and Alize (Lilikoi) Liqueur) — soooo delicious, then I’m not sure about the last two. I think perhaps Erup-Sean (A blend of Bacardi Light Rum, Banana Liqueur, Bananas, Strawberries, and Lilikoi juice) and something else. Al? Julie? Help? I asked Yut, but he barely remembers getting a drink. 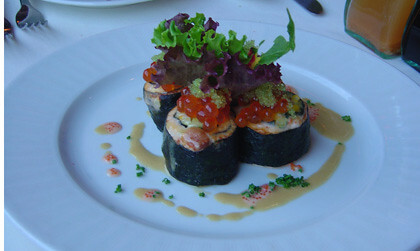 Hot “California” Rolls…But with No Rice Baked Kona Lobster Mousse wrapped in Nori with Crab Avocado Stuffing. This was amazing. Seriously, so good I almost peed in my pants. I don’t even like the salmon roe stuff usually, but it was perfect in every way. 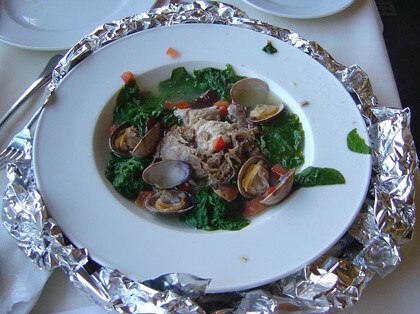 “Da Bag” Steamed Clams with Kalua Pig, Shiitake Mushrooms and Spinach in a Foil Bag. Dayne, one of the waitstaff, opening up da bag. 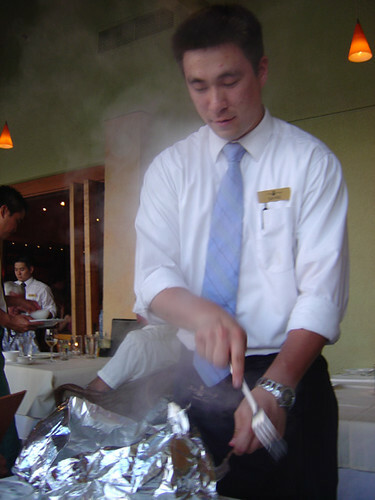 Look at all the steam! And here it is, opened:) Delicious! The juice was good with bread. Really good roast pork taste, tender clams. After the California Rolls though, it wasn’t at that level, cos it wasn’t super special. I almost felt like we could get this type of appetizer anywhere. 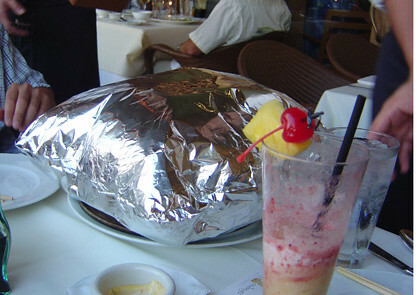 Except that the kalua pork is a Hawaiian thing. 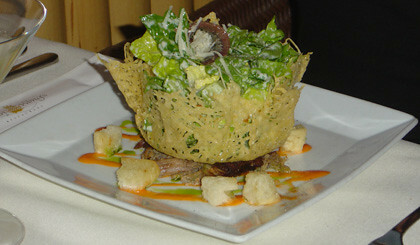 Appetizer Duo “Soup and Sandwich” — Nori Wrapped Tempura Ahi, Tomato Ginger Relish, Soy Mustard Sauce. Yut and Al got the 5-Course Menu Sampling. This was the first course. The fish was really fresh and good and we both really liked the Tomato Ginger sauce/soup thing. 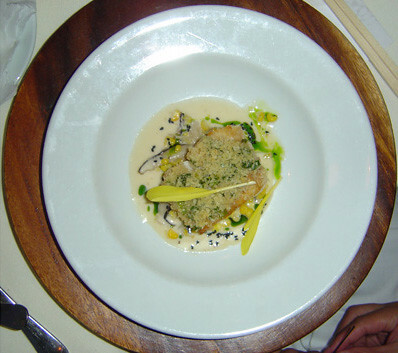 Ginger Crusted Onaga Miso Sesame Vinaigrette, Shiitake, Enoki Mushroom and Corn. 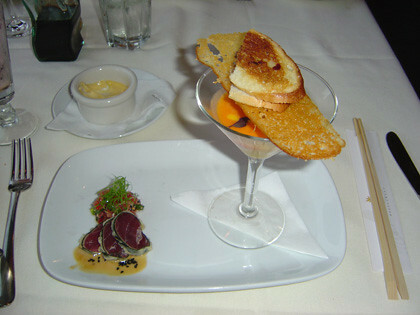 The second course of the menu sampling. Onaga is a long-tail red snapper. Yut really likes ginger, so this was right up his alley. 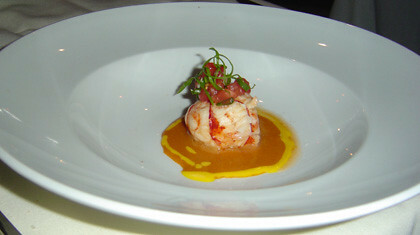 Butter Poached Kona Lobster Peruvian Shellfish Sauce, Lomi Tomato Relish. 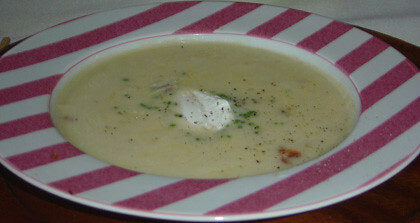 The third course. Really sweet, fresh tasting lobster cooked perfectly. 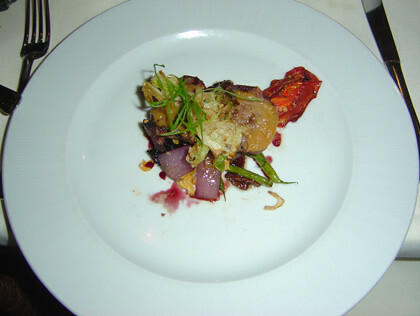 Maui Cattle Company Beef Tenderloin Mushrooms, Haricot Vert, Bacon Salad, Port Wine Reduction. 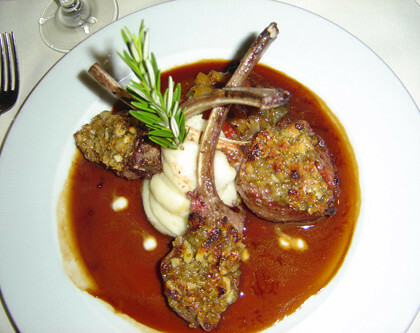 The fourth course. Good, but not stunning. I think it’s cos at its simplest, it’s a piece of beef steak, done nicely, but lots of places do beef quite nicely. 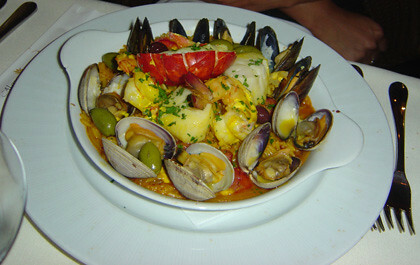 Seafood Paella Lobster, Scallop, Shrimp, Clams, Paella Style Rice. Julie got this as her entree. I think it was pretty good. 5 Spoonfuls of Brulees. 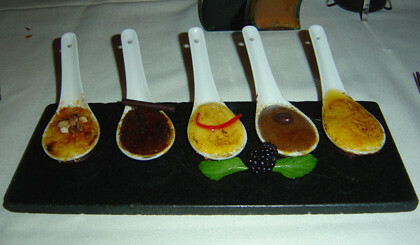 As the name implies, it’s 5 different flavors of creme brulees served in spoons. Cute, eh? :) Really yummy too. There’s macadamia nut, chocolate, orange zest, kona coffee, and some liqueur one. All complete yummiliciousness:) I was pretty close to calling it and not getting dessert, but it’s the whole, “when are we gonna have a chance at this ever again?” mentality. We figured brulee would be easy to eat even if we were full. Julie got coffee instead of dessert. They have all sorts of single estate vintage (if that’s the right word — the year is clearly stated) coffees to choose from, brewed in a French press brought to the table. Dessert Duo Coconut Tapioca on one side, Chocolate “Crunch Bars”: Layers of Macadamia Nut Crunch and Bittersweet Chocolate Mousse on the other. 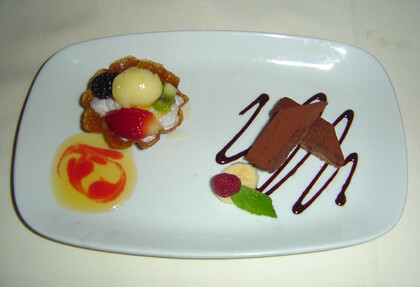 The last course of the menu sampling. Those crunch bars were sooo delicious. So so delicious. Mmmmmmmm. They brought these out at the end right before the check. 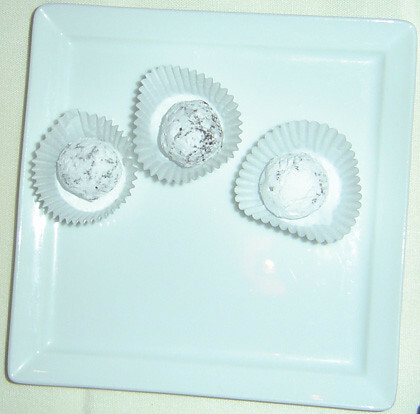 They’re these small light chocolate covered macadamia bon-bon things. Everything quite delicious. So full after. Looking through these pictures and writing about them just makes me really crave a mango melange a trois and them hot california rolls. If I could just get them two and maybe the brulee, gawd that’d be so awesome. Dang! That’s some fanciness you got there. Looks really good. Oh yeah, I actually wrote a review through 360. Dunno if it’s actually posted, but I’ll put it up on the 360 too.